Construction materials [sand, gravel, additives, mineral adhesives, etc]. 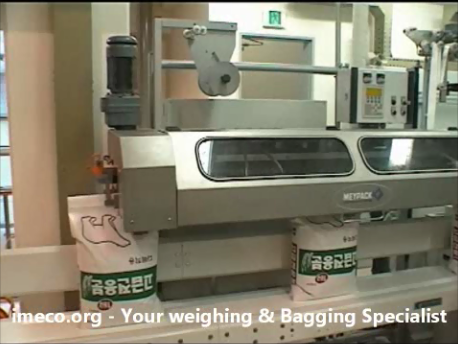 The FTS bag closing machines operate in continuous. Heavy duty carrier chains keep the flattened bag top perfectly aligned whilst it passes through the different steps of operation. At the same time the sack is supported by a conveyor. 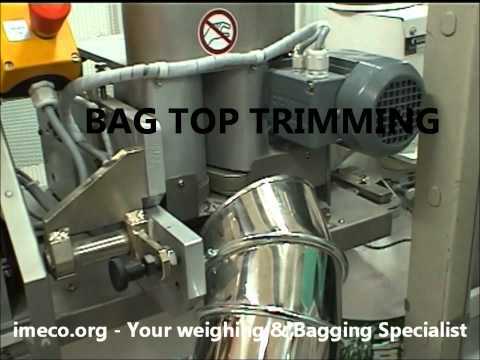 The bag top is trimmed parallel to the folding line which allows the closure of the bag as near as possible to the product level. Once the bag top is perfectly trimmed , it will crease and folded over twice and finally a coated paper tape is sealed on it. In the FTS-HD type an additional operation is carried out, the sealing of the PE inner liner. As an option the machine may apply a tear strip to the coated tape to enable easy opening of the filled bags. THANKS TO THE ADJUSTABLE TOP TRIMMING PERFORMING THE FINAL SEALED BAG WILL ALWAYS GET A PERFECT FILLING RATIO.